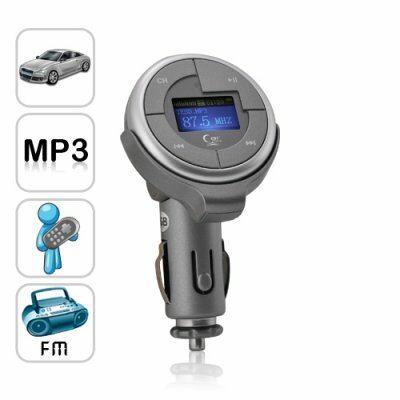 Successfully Added Car MP3 Player with FM Transmitter and Remote Control to your Shopping Cart. Listening to your favorite tunes while driving just got a lot easier thanks to this Car MP3 Player. Simply transfer your songs inside and use the FM transmitter to play them directly through any FM stereo receiver, like your car DVD player or speaker system. Plus, you can control everything with the included remote control! Simple, yet extremely convenient, this Car MP3 Player is the ideal way to enjoy your favorite songs from inside your car. Just use a basic USB connection to transfer music from your computer onto the device's 2GB internal memory, then use the FM transmitter function to play it straight from the radio of your car DVD player or hi-fi car stereo speaker system! What other specials do you get with this Car MP3 Player? Stand-alone MP3 Player: This Car MP3 Player is detachable for use as a normal 2GB MP3 Player. It's also small enough to fit in your pocket and around your neck, making it ideal to take with you anywhere. LCD Screen: A crystal clear LCD screen is available for viewing of anything from battery power left to track/FM frequency selection to song lyrics. That's right, this Car MP3 Player can display song lyrics (lrc file format) so you can sing along with your favorite artists! Remote Control: Even though there are buttons built-in that allow for total control, this Car MP3 Player includes a remote control that allows for a safer, more convenient listening experience while driving. And more! This Car MP3 Player is ideal for use in the car or on the go and is available right now for single and bulk orders. Click "Add to Cart" now, and we'll ship you a sample straight away so you can see for yourself how amazing it really is! Brought to you by Chinavasion, the leader in wholesale electronics and car accessories. How does the FM transmitter work on this Car MP3 Player? Just select a channel on your car's radio player and change the Car MP3 Player's channel to match it! Then you can hear the music directly from the car's speaker system, amazing! Does this model come with an onboard speaker? No, you can hear the sound through the earphones provided or your car's speaker system.